A bold, yet utterly feminine ladies' Jacqueline watch by Fossil, styled with a rose gold-plated stainless steel case, rose coloured dial with date window, elegant Roman numbering, and brown and red coloured indexes. Its warm sand coloured leather strap fastens with a pin and buckle. 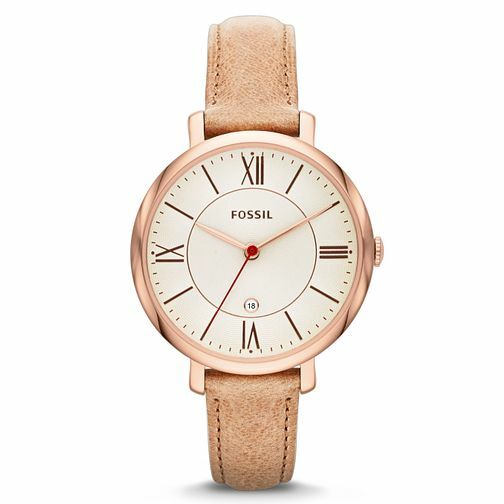 Fossil Ladies' Sand Leather Strap Watch is rated 5.0 out of 5 by 2. Rated 5 out of 5 by Anonymous from Love! For my 21st birthday I originally got a watch which I didn't like so I went to pick one to swap it with. I thought i'd found one which I liked, then my boyfriend spotted this beauty. With its neutral colours and rose gold touches I could hardly say no to a stunning watch like this. It looks so much nicer in the flesh too. I think it's perfect for both everyday and use for special occasions and is great for all ages. I love it so much and want to keep it forever! Rated 5 out of 5 by Anonymous from Very elegant For my recent birthday my son bought this very elegant fossil watch for me. I am so pleased with it, it matches any of my outfits and for all occasions.